While the X-TankCopter is being made. 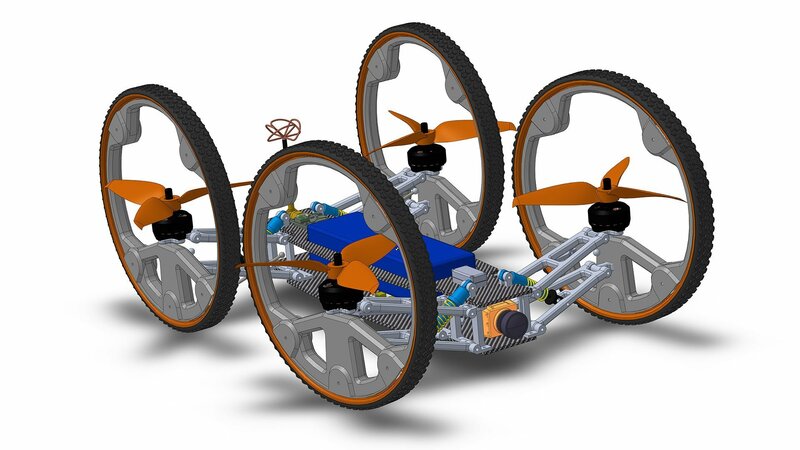 It is the the time to get back to work on the the CarCopter. Just video remainder of the very first prototype. 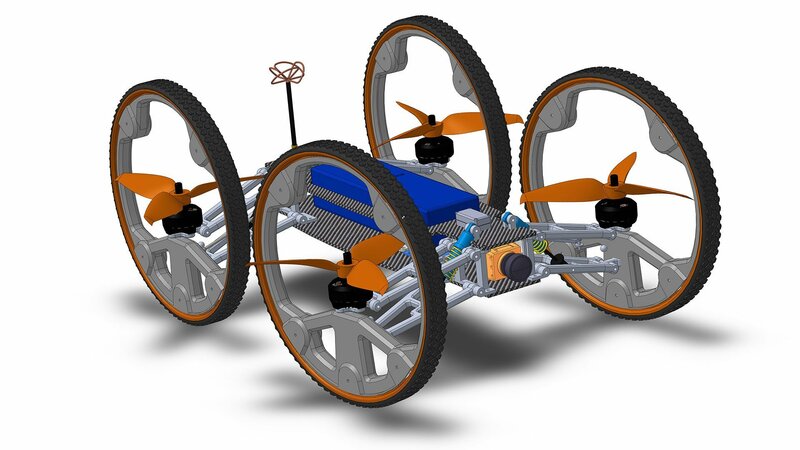 This post highlights the first concept of the flying car, there are 3 other versions to be designed, all of them are quite different from each other.The objective is to create the best combination of air and ground performance. Therefore, I would be more than happy to hear your opinion. Hopefully that will help us to choose the best version. The proposed concept is based on 5-inch propeller, so relatively small. The weight is about 930 grams. You can see the size of it on A4 sheet. 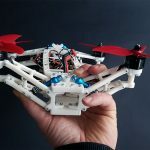 Due to the revolution in drone race field, there are a plenty of motors to choose from, they capable of producing 650 g of thrust from 3 s battery and over 1700 g from 4 s (5-inch propeller). So, there is an easy way to upgrade (double) the air performance, going crazy we can even use coaxial setup (two Contra-rotating propellers in the wheel), but definitely there is no need. 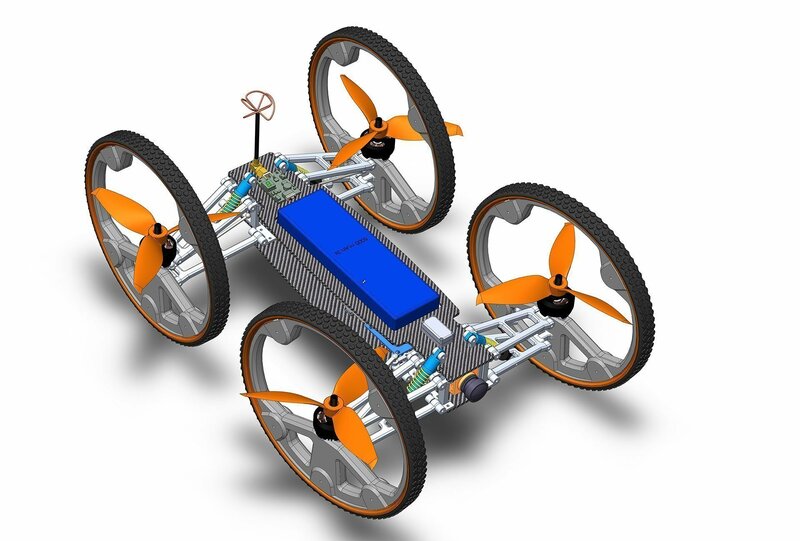 The presented model is based on 3 s (11.1 V) 5000 mAh battery, the expected hover time is about 13-15 min. The thrust to power ratio is about 2.7:1. The on-board camera will probably be RunCam Split as it is only of its kind. It provides amazing recording video quality (60 fps 1080p) while streaming low latency live video (FPV). The Flight Controller, CleanFlight, BetaFligt or similar. Frame materials: carbon fibre and duraluminium, Nylon or ABS-PC wheels housing, POM gears. Equipped with huge wheels (16 cm in diameter ! ), will provide a good performance in rough terrain. 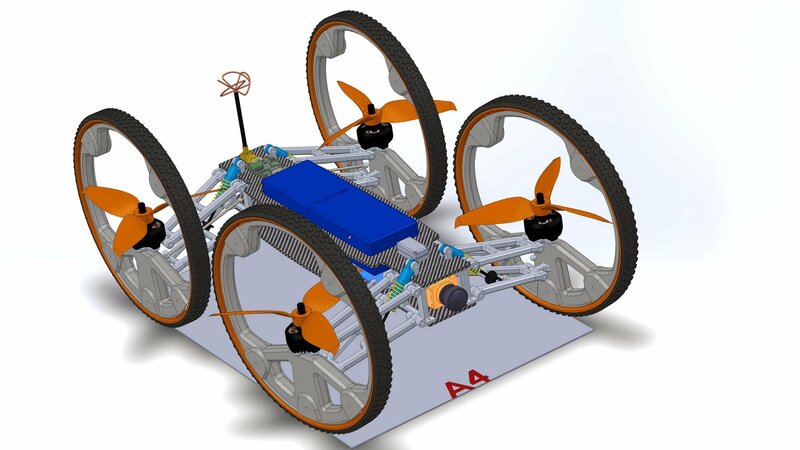 Drone should be able to cross obstacles that would be a problem for most of the RC cars. Suspension, with a good clearance of 40-50 mm. Ackerman Steering System, rear wheel drive and differential. Powered by 400-500 W motor. Here is an interesting part. The question raises: how the suspension will affect the stability of the drone in the air? Since propellers are suspended on moveable arms. The thrust vector does not change the direction, as all propellers stay parallel to each other and perpendicular to the frame. The only change is the temporary force magnitude applied to the main frame ( due to the momentum of the suspended arm). In theory, tunning the PID and choosing the right compression of the shock absorbers should solve the problem. The drone may lose a bit of its agility but it should still fly well. Also, the drone may be less sensitive to lateral gusts, as the arm can move up or down and compensate for a momentary gust (similar to driving on the ground). This is the only theory, real-life testing is essential in order to gather the data. But I would love to hear your thoughts. Stay around to see more development post, you can follow the new post or comment by ticking the check-boxes at the bottom of the page. If among your friends you have, engineers, hobbyists or new tech lovers, please share this post with them. The more feedback at the R&D stage, the better the drone will be. I am sure they will find it interesting, in the end, we’re building a flying car here. I simply want to tell you that I am new to blogging and site-building and certainly loved your web-site. Very likely I’m likely to bookmark your website . You certainly have good writings. With thanks for revealing your blog. at what price would you expect it to be? i would love to see a bigger or better better as an additional choice for more money. Probably, it will reach the market around August 2018. That what I call the innovation and challenge at the same time. Interesting concept ( I have not seen any drone like that, so far). The movable arms, may cause a lot of trouble, but let see. Hopefully, first flights will take place in 1-2 months. Thanks, hopefully, the final model will be even more aesthetic. I will make sure it has a nicely designed canopy too.